With Speaker Joe Straus leaving the Texas House and Speaker Paul Ryan leaving the U.S. House, things are going to change in government. But most of us don't get a say in their replacements. 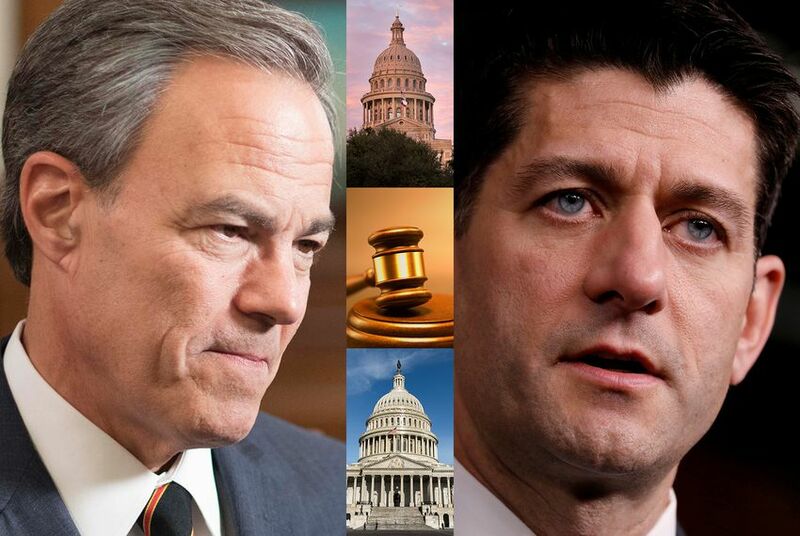 Joe Straus and Paul Ryan are quitting, leaving the Texas and U.S. houses in some state of shock — and the rest of us wondering what all the fuss is about. The two speakers are the most powerful elected officials most of us never vote for. Straus is one of 150 members of the Texas House, installed by the voters of his San Antonio district. Ryan is one of 435 U.S. representatives, elected by voters in his home of Wisconsin. Both were put in high office by their peers — not by their voters. That makes their departures strange: Most of us aren’t their constituents. When a president or a governor or a U.S. senator leaves, voters can either mourn that they’re losing a champion or cheer at the fresh chance for a favorable change. When speakers leave, some voters might have an interest, either in the policies they control or in the drama of it all, but ultimately have little say in who’ll replace them. Straus will be in the speaker’s office until next January, and Ryan — if the Republicans in the U.S. House don’t demand a quick substitution in this uncertain election year — could stay in his seat for just as long. Once you announce a political retirement, your power is gone. It’s over. You’re inconsequential. Government is a forward-looking enterprise, and the people who were professional friends only — you know, the ones who didn’t start coming around until you ascended — disappear. They don’t just fade into the woodwork. Rather, they join the line of supplicants to your successor. Their loyalty wasn’t to you, but to the office you occupied. They need to be close to the people in power or soon to be in power. Speakers are less an expression of public sentiment than of legislative process. And the Texas model differs significantly from the federal version. Ryan is much better known, the personification of the U.S. House. Straus, like most of his predecessors, isn’t a household name statewide, even after almost a decade in the top office. In both cases, the retirements have thrown constituents — the representatives who elect them — into action. When a speaker hands in the gavel, aspirants jump into something akin to a race for class president, albeit with more at stake and more money to play with. They know each voter personally (or will, after the elections are over), and they’re already burning up their phone batteries and flying around to see everyone at home. The races to replace them will play out differently. In the U.S. House, party caucuses have real power. Majority parties get the plums and the caucuses have a loud voice in who gets what. Dominant factions decide who gets to be in management. Republicans hoping to hold their majority in President Trump’s first midterm election will be relying on money and strategy pulled together by Ryan or his successor. In Texas, to the continuing frustration of partisans outside the Capitol, party has less to do with it. Straus started as a coalition speaker, initially vaulted into office by an alliance of fewer than 20 Republicans and nearly all of the Democrats in the House (he won the next four elections for speaker with enough Republican votes to make a majority even without the Democrats). His predecessor, Republican Tom Craddick of Midland, had the help of a similarly small-but-significant number of Democrats when he took office. U.S. House elections turn on party factions and the national political mood. Texas races are probably better analyzed by psychiatrists than by political pundits: Personal relationships, ambition and a light touch are more important than party and ideology. Historically, Texas representatives have preferred speakers who mostly let them go about their business with minimal interference. Not that outsiders aren’t interested in the outcome. Everyone frustrated with the current speakers has a shot at change here. In Austin, the Texas House has lately been slow to get in line with the Senate on some issues; the so-called “bathroom bill” was a famous example. That’s got Straus Republicans nervous about keeping up the resistance with a new speaker and his foes hopeful that Straus’ replacement will be more to their liking. That’s important to voters, too. But electing a speaker is an inside game. We’re not the voters — we’re just the people who elect the voters.